I had the honor of speaking at my local MBAA chapter’s quarterly last night. While we socialized and sampled a great variety of beer, I noticed that someone had put out a large box of churchkeys for bottle opening. This was the biggest supply of that traditional, long-forgotten opener I’ve seen since I was a kid, and it reminded me of this photo sent by my friend Abe. Thanks to Lars, Jeff, Brian and the rest for inviting me to talk last night. 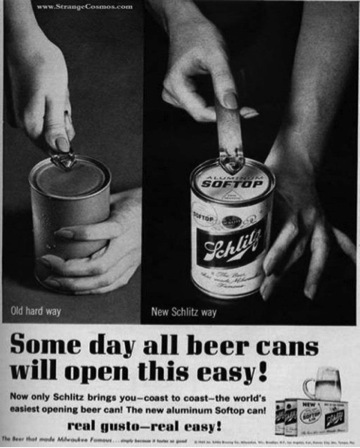 If you remember the days of pull-tab necklaces, then you might like this follow-up to last week’s link about a revival of the flat topped can: It’s a link to the history of the pull-tab can end. Thanks to my colleague JP for this idea and last Friday’s fun as well!